Now, we all know what happens at happy hour, we hurry to drink before the specials are over and then we’re starving so we go somewhere and eat like there’s no tomorrow. At Truluck’s you don’t have to worry about disappointing bar food or the nuts that everyone touched (yuck). The half price appetizers are actually really good and you can’t beat the prices. The appetizers below ranged from $6- $8! 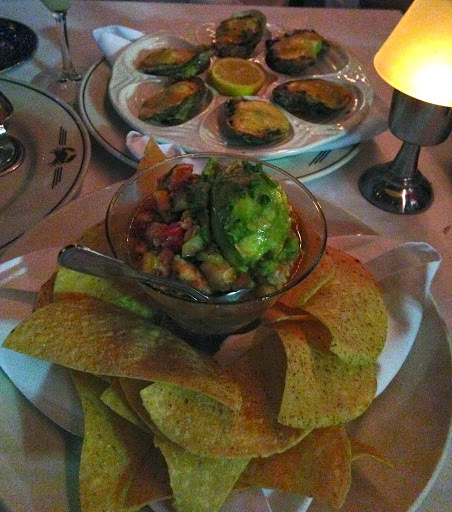 We ordered the Oysters Rockefeller (seen at the top of the picture) and the Baja Ceviche. Both were good, I really like the Baja Ceviche, because it’s light and refreshing and has plenty of avocado which is always a plus and who doesn’t love crispy chips. The Oysters were cooked and had a melted cheese sauce on top. Definitely worth a try, however, I always prefer my oysters raw! The Salt and Pepper Calamari was a hit as well and seasoned perfectly, none of that boring soggy calamari you may have had at other places (I know I have :/). 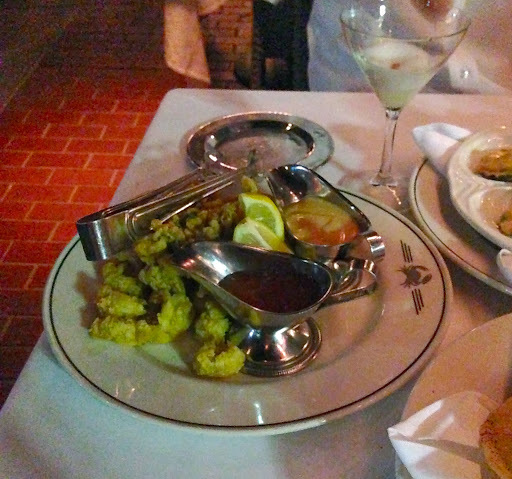 It came with 2 sauces that both paired well with the calamari, I preferred the tomato based sauce. Also, I’ve had a few cocktails here and they have all been good, on this night, we tried their Pisco Sours which were ok, I would recommend getting their other cocktails. Change up your typical happy hour plans and head over to Truluck’s, where you can drink and eat great food too. Afterwards, step out to the other bars in Brickell and continue your night! Enjoy!